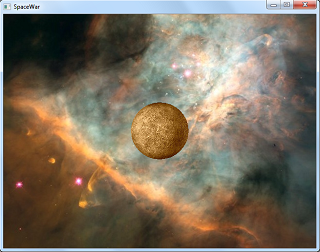 Fills the window with the image of a nebula and draws a planet over the nebula. The planet is drawn using a DirectX sprite with transparency. Draws a spaceship at 1X scale and again at 8X scale. The 8X ship has a visible border because the source image does not have a minimum 1 pixel wide transparent border. Adds an animated spaceship to the Planet program from above. 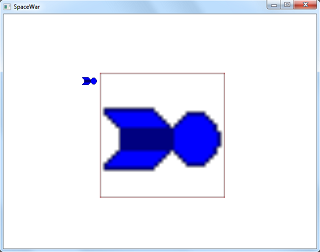 Demonstrates how to use the Image class to draw animated sprites. A spaceship flies from left to right across the space scene while rotating and getting smaller. Demonstrates how to move and rotate an Image. Demonstrates how to make Images wrap around the window. An animated spaceship may be moved around the window by pressing the arrow keys. Demonstrates how to get user input with the Input class.